At an April 2011 Congressional hearing on creating Environmental Protection Agency (EPA) standards for mercury and sulfur dioxide emissions at coal-fired power plants, some members of the committee hearing the new rule simply didn’t believe either pollutant was dangerous to health or needed regulation. For its part, the EPA had estimated the new standards would prevent 17,000 premature deaths annually. “I am not a medical doctor, but my hypothesis is that is not going to happen,” one congressman said, and accused the agency of fabricating its numbers. The committee member soon received a letter signed by the heads of the American Lung Association, the American Academy of Pediatrics, and the American Public Health Association, among other organizations, begging to differ. “We are [italics added] doctors, and we see in the patients we treat what the scientific literature lets us know to expect: air pollution makes people sick and cuts lives short,” the letter read. It noted that mercury is particularly hazardous to fetuses and young children, in whom high concentrations can impede brain and nervous system development. The health professionals—organized by the American Lung Association, a Hewlett Foundation grantee—provided the committee with citations for thirty peer-reviewed medical studies affirming the health impacts of the two pollutants and other airborne pollution. The Foundation is one of many funders across the country supporting the work. The quick response of the Association and its peer organizations is part of its Healthy Air Campaign, which is working to protect the federal Clean Air Act by centering the debate about air quality standards on public health. Ultimately, the doubting committee member refused to change his views, but the larger point had been made. The Association recently launched a provocative print and television campaign called Red Carriage, which is designed to encourage policymakers to think about the impact that pollution has on children. 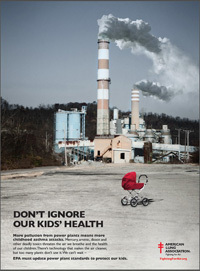 The campaign features a red baby carriage placed near sources of pollution, like power plants. Currently, Iwanowicz says, a convergence of factors is putting the Clean Air Act under threat. Court-ordered deadlines for enforcing its provisions have encouraged polluting industries to push back with media attacks that claim this enforcement would cause job losses and hurt the economy. At the same time, EPA’s plan to regulate emissions of greenhouse gases has further roiled industry. The agency’s current rule-making cycle for the Clean Air Act will substantially reduce air pollution, improve public health, and move the electricity generation sector away from coal and toward clean fuels. Donald Hoppert, director of government relations for the 25,000-member American Public Health Association, whose executive director also signed the letter to the congressman, adds that the involvement of groups like his gives the public a different way to think about environmental issues. “People think about their health a lot, although they may not consider that aspect of some environmental laws,” Hoppert says. “We can help them put the health impact in context.” This helpful perspective comes from the American Public Health Association’s broad range of health professionals, from workers in state and local public health departments to physicians to public health nurses and academics. Not surprisingly, they have joined the American Lung Association’s Healthy Air Campaign to support the Clean Air Act. Overall, since its original passage forty years ago, the Act is credited by researchers with preventing 228,000 premature deaths; 692,000 cases of chronic bronchitis; and millions of asthma attacks, while saving the U.S. economy more than $1.2 trillion in health costs and lost economic productivity in the past twenty years alone. Since 1970, it has reduced by 60 percent the nation’s most widespread air pollutants, while the economy has grown by 209 percent. For the Foundation, whose environmental focus is on cleaner energy alternatives, opposition to coal-fired power plants is a way to support two socially desirable goals at once. Coalition Building. The American Lung Association will join with other public health and medical organizations to support clean air regulations. Media Outreach. Building on the Association’s reputation, the Campaign will educate the public and decision makers on the value and benefits of clean, healthy air, relying heavily on social media to raise awareness. Community Outreach. Resources will allow community spokespeople to be identified, trained, and backed during their work. They will include members of the Campaign coalition as well as individuals such as patients and their caregivers who have faced personal harm from air pollutants.Iwanowicz says the Association has created committees in six states, with a seventh to be named soon, to work on the local level in support of clean air. These committees are working with grassroots health and education organizations in Montana, Michigan, Ohio, Pennsylvania, Massachusetts, and Maine. Policy Promotion. The Association will back proposed EPA rules to improve air quality.